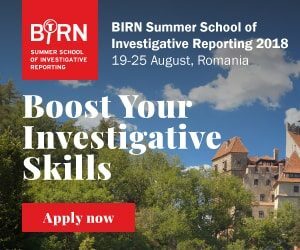 This year’s BIRN Summer School of Investigative Reporting will take place at the Teleferic Hotel in Poiana Brasov, Romania from August 19 until August 25, 2018. The Summer School will bring together a superb line-up of journalists and trainers. The lead trainer will be Blake Morrison, investigative projects editor at Reuters in New York and lecturer at Columbia University, New York. Others trainers will include New York Times Senior Journalist, Christoph Koettl; Bellingcat European Press Prize winner in 2017, Christiaan Triebert, Knight International Journalism Award winner and OCCRP editor Miranda Partucic; winner of Peabody and Emmy Awards and co-creator Of podcast Reveal Susanne Reber and more. From day one, participants will work and collaborate actively in small groups to pitch an investigative story idea. All participants will have the opportunity to research and develop their idea into a full story. The course fee of 750 euros is all-inclusive, covering tuition, room and all meals. The fee also includes BIRN’s textbook ‘Digging Deeper: A Guide for Investigative Journalists in the Balkans’. Deadline for scholarship application is July 15, 2018 while for standard applications (for non-scholarship applicants) is August 1, 2018. All Balkan journalists are eligible to apply for a scholarship that will cover accommodation, full board, participation fee and travel costs up to 100 euros. International participants can apply for the Summer School as well, but they will need to pay the full participation fee. The participants will spend a week in the peaceful resort, surrounded by the forests of Transylvania. They will also visit one of the “scariest” place in Romania, Count Dracula castle. 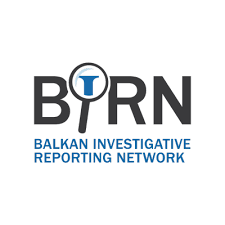 For more information about the enrolment requirements, trainers and agenda please check BIRN Summer School of Investigative Reporting page www.birnsummerschool.org.